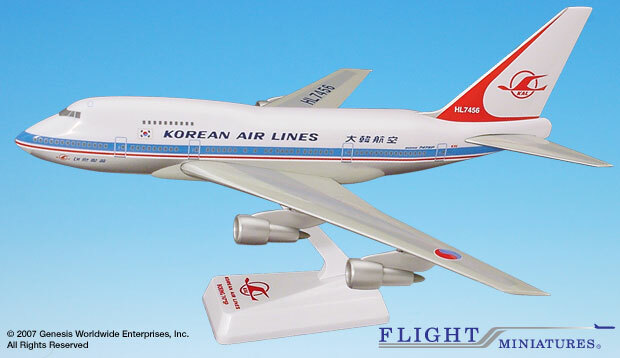 Flight Miniatures 1:200 Scale Plastic Snap-Fit – Boeing 747SP – Length:11.125" Wingspan: 11.75"
Korean Air Lines was started by the South Korean government in 1962. In 1969 the airline became privately owned when it was acquired by the Hanjin Transport Group. The airline changed its name in 1984 to Korean Air. Korean Air operated two 747SPs in their fleet from 1981 until 1998. This model represents the airline's first 747SP, ship HL7456, in its original delivery colors. It was delivered to the airline on January 22, 1981, and in November 1998 it was retired from the fleet along with the other 747SP. The Boeing 747SP shares 90 percent commonality with the 747-100/-200, the most noticeable difference being that the fuselage is 48ft 5in (14.7m) shorter. Other differences include structural changes in the wings, notably a simplified single-slotted flap system, and extended horizontal and vertical stabilizers. The reduced size and weight of the 747SP provided for increased range, greater cruising speeds, and reduced fuel consumption.